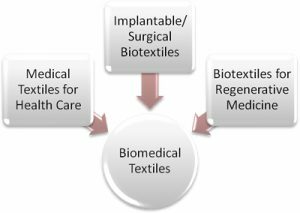 NC State University offers a medical textiles curriculum for the very first time anywhere in the world as part of a university bachelors degree program. The students taking medical textile courses can find summer internships and permanent employment following graduation at local, national and international medical textile, medical device, biotechnology and pharmaceutical companies, such as Johnson & Johnson, 3M, Medtronic and Pfizer. Other students find career opportunities in government departments that are responsible for regulatory affairs, such as the Food and Drug Administration, or in clinical and administrative functions within the healthcare sector.